An affluent suburb located just south of the city center, Camps Bay has a long history as a recreational retreat for visitors to Cape Town. In the 19th and early 20th centuries, day-trippers came to Camps Bay to picnic, swim in the tidal pools and admire the breathtaking scenery. Today, the village-like suburb is famous for its beautiful white sand beaches and its location between the azure Atlantic and the Twelve Apostles mountain range. It’s also a popular hangout for celebrities and the ultra-stylish, complete with 5-star boutique hotels and gourmet beachfront restaurants. Here are the best things to do during your stay in Camps Bay. At the geographical and social heart of Camps Bay lies Camps Bay Beach, the suburb’s best place to see and be seen. A magical stretch of pure white sand fringed by the ocean on one side and the mountains on the other, it was awarded Blue Flag status in 2008. Come for a picnic or to brave the chilly waters of the Atlantic; or for a stroll along the palm-fringed boulevard with its trendy cafés, restaurants and shops. If you do decide to swim, make sure to stay within the areas designated by the lifeguards, as rip currents and waves can both be strong here. With its westward-facing views out across the ocean, Camps Bay Beach is also the ultimate sunset spot. In summer, Camps Bay Beach can get crowded. If you’re looking for a little peace and quiet, consider driving 10 minutes south along scenic Victoria Road to Oudekraal beach instead. Once a refuge for escaped slaves, the beach is now an off-the-beaten-track destination for those in the know. It’s protected by massive granite boulders, allowing for wind-free sunbathing and calm waters perfect for swimming and snorkeling. When you’ve had your fill of beach time, you’ll find shady picnic sites scattered beneath the neighboring milkwood trees. Bring your own meat and firewood, and spend the rest of the afternoon practicing the art of the South African braai. Camps Bay is known for the quality of its seafood restaurants. For a memorable fine dining experience, make a dinner reservation at Paranga. Located on the Camps Bay beachfront, this upscale spot boasts unobstructed views of the ocean best admired from its sidewalk tables. The menu focuses on seafood and specializes in freshly prepared sushi. If you’re looking for somewhere a little more relaxed, try local favorite Codfather Seafood & Sushi. It features a wine cellar, a cozy fireplace in winter and a welcoming family atmosphere. The one thing it doesn’t have? A menu. Instead, friendly waiters guide you through the daily selection of fresh seafood. The most iconic address in town is the historic Bay Hotel, a 5-star option with an incredible beachfront location, four swimming pools and a spa. In particular, the hotel’s Sandy B Private Beach Club is one of the most exclusive nightlife spots in the city. Alternatively, Camps Bay Retreat is a boutique option for those with relaxation in mind. Set within four acres of lush garden, the retreat includes a mountain meditation pool and wellness spa. Guest houses are another Camps Bay specialty, with one of the best choices being Primi Seacastle, a 4-star pick with 10 unique rooms. All of them boast exquisite Moroccan-inspired decor and most have stunning sea views. 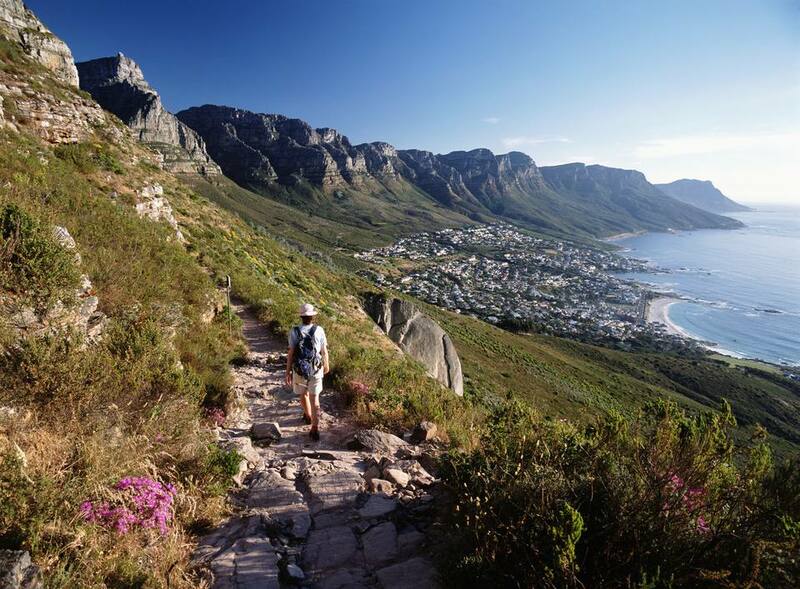 Fitness enthusiasts and nature lovers should make time to explore the Pipe Track, a little-known trail that makes its way from Kloof Nek (at the base of Table Mountain) to Camps Bay. The trail follows the course of an old pipeline built to transport water from the Disa River to the city center. Along the way, it treats hikers to a series of unforgettable ocean and mountain vistas; and although the terrain is uneven, it’s not too challenging for anyone of average fitness. From start to finish, the trail is approximately 6 kilometers in length. It takes around three hours to walk there and back; but if you want to walk one way only, you can use MyCiti bus #107 to reach the start point. Take a trip along the picturesque coastal road between Camps Bay and Hout Bay to find the popular Camps Bay African Craft Market. This open-air extravaganza is one of the best places in Cape Town to stock up on traditional souvenirs from all over Southern Africa, including hand-carved statues, beaded jewelry, leather crafts and more. Prices are low compared to what you can expect to pay for similar goods in Cape Town city center, and haggling is expected. Open every day during daylight hours, the market is also worth visiting just for the beauty of its location — so even if you don’t plan on buying anything, stop by to soak up the atmosphere instead. For surfers, Camps Bay is all about Glen Beach, situated a 10-minute stroll across the sand dunes from the main beach. Known for its gnarly right-handers and hollow barrels, Glen Beach is a prime surf spot - but it’s not for the faint of heart. Expect strong rip tides, cold water and the occasional territorial local. If you’d rather be under the water, there are some excellent shore diving sites nearby. Camps Bay Reef offers beautiful swimthroughs and kelp forests, populated by fascinating temperate marine life including the charismatic pyjama shark and the puffadder shyshark. Meanwhile, Oudekraal beach is the entry point for shore dives to the famous Antipolis wreck. After dark, Camps Bay becomes the gathering place of choice for Cape Town’s beautiful people. Start your evening with artisan cocktails at Café Caprice, the suburb’s best-loved spot for people-watching over beachfront sundowners. Japanese restaurant Umi attracts a chic crowd to its upscale whisky bar; while Dizzys is a more relaxed watering hole known for its craft beers, thin-base pizzas and regular live bands. The latter is also your go-to for karaoke, and stays open until the early hours. For a spot of high culture, head to intimate venue Theatre on the Bay, home to a full spectrum of dramatic arts from musicals and plays to comedy and cabaret.